As we discussed yesterday, some of the Mughal destruction of Hindu temples was said to have been motivated not be religious fervor, but simply by greed. And we can add to that, by politics. Not only was the wealth of pillaged temples used to finance future invasions, but the destruction of temples also had a huge psychological impact on the citizenry. If a prominent temple was located at the center of an invaded region, it stood as a constant challenge to the invader's supremacy. The temple represented to the people that God was on their side against the infidels. When the temple was destroyed the result was not a loss of faith, but the de-legitimizing of the local Indian rulers. Many campaigns were carried out by the Mughals, selectively targeting important temples to destroy based on how debilitating the effect would be on local rulers. Along with deities, there were often murtis or sculptures in the temples of the local royalty and members of the ruling administration. These were naturally a prime target for the Mughal intruders, who were happy to sweep away all signs of Indian legitimacy. "…temple-breaking, especially of temples associated with ruling houses, was essentially a political, rather than simply religious, act. As proof of this thesis he cites instances of the sacking of royal temples of Hindu rulers by rival Hindu kings as early as the sixth century C.E. In AD 642 C.E. the Pallava king Narashimhavarman I looted the image of Ganesha from the Chalukyan capital of Vatapi. In the eighth century, Bengali troops sought revenge on king Lalitaditya by destroying what they thought was the image of Vishnu Vaikuntha, the state deity of Lalitaditya's kingdom in Kashmir. In the early ninth century the Pandyan king Srimara Srivallabha also invaded Sri Lanka and took back to his capital a golden Buddha image that had been installed in the kingdom's Jewel Palace. In the early eleventh century the Chola king Rajendra I furnished his capital with images he had seized from several neighbouring Chalukya, Kalinga and Pala rulers. In the mid-eleventh century the Chola king Rajadhiraja defeated the Chalukyas and plundered Kalyani, taking a large black stone door guardian to his capital in Thanjavur, where it was displayed to his subjects as a trophy of war." Unfortunately, Eaton fails to make clear the relationship between most Vedic kings and the temple deities. Granted, there was a posture of shared sovereignty insofar as the king saw himself as a servant of the deities, empowered by God to lead and protect the citizens in the mood of sanatana-dharma. But to suggest that the kings politicized the deities, which would mean knowingly making them targets of political attack, is not a notion supported by history. In most cases, deities that were looted by one Hindu king from a temple in another Hindu king's domain were not destroyed. They were stolen, yes, but they were reinstalled in another temple in the victor's region, where they continued to receive worship. This is a far cry from stealing the deities and smashing them to rubble. Nowhere have we seen an instance where the Hindu deities were stolen by Muslim intruders and later installed in a mosque. Obviously that didn't happen, as it goes against the core principles of Islam, which does not permit deity worship. So we find Richard Eaton's arguments in this regard unconvincing. To suggest that based on this evidence of so-called 'shared sovereignty', we should all conclude that "the iconoclastic zeal of the Muslim rulers of India must not be exaggerated", is illogical. "In these days information has reached our court that several people have, out of spite and rancour, harassed the Hindu residents of Benares and nearby places, including a group of Brahmans who are in charge of ancient temples there. These people want to remove those Brahmans from their charge of temple-keeping, which has caused them considerable distress. Therefore, upon receiving this order, you must see that nobody unlawfully disturbs the Brahmans or other Hindus of that region, so that they might remain in their traditional place and pray for the continuance of the Empire." In our next segment of this series we'll jump forward in time to the 1661 A.D. Mughal campaign in Kuch Bihar, northern Bengal. In many ways, the Mughal occupation of Bengal was unusual, compared to their presence in other regions of north and central India. In this instance, for example, Mughal authorities were intent on destroying the deities in the temple patronized by local Bihar royals, but the invaders were said to have been under strict orders not to touch or destroy the property of the local people. 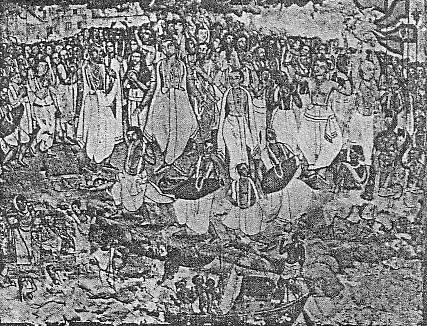 That the Bengalis were spared the some of the harsh treatment often dealt out by the Mughals is perhaps due to the lingering mercy of Sri Caitanya Mahaprabhu, who impressed so many local Muslims during His manifest presence in Bengal.